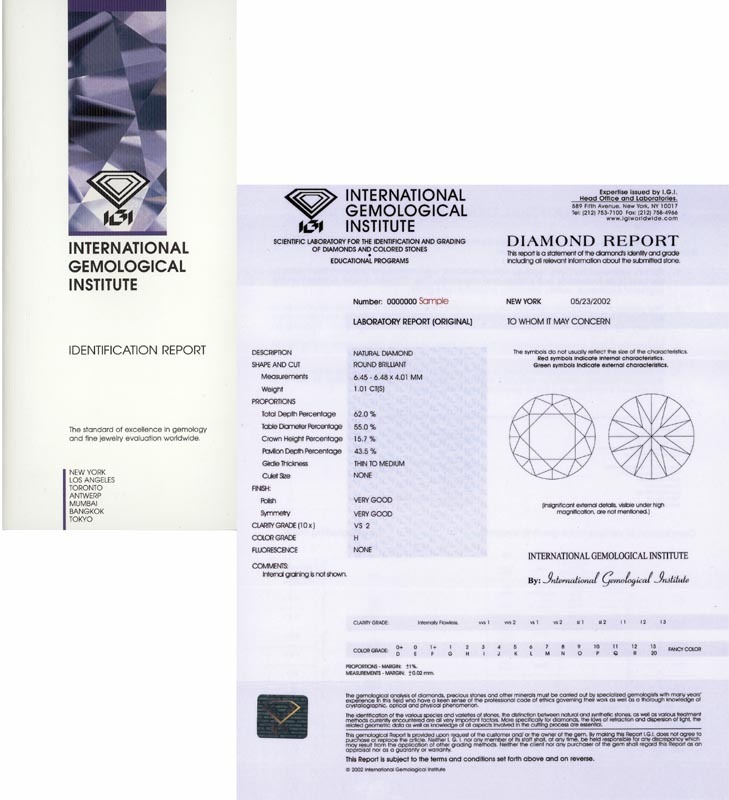 The IGI Diamond Report is essentially a statement attesting to the authenticity of a diamond and provides a reliable and accurate report of its identity and grade based on an internationally recognized system. Each diamond is scientifically analyzed by several gemologists who use their experience in combination with state-of-the-art equipment to produce an accurate description of the characteristics of the diamond and the quality of its cut. With its detailed information presented in understandable language, the different qualities of a diamond can be truly appreciated. The grade or quality of a diamond is based on four characteristics commonly referred to as the 4Cs: the Carat weight, Color, Clarity, and Cut. These are analyzed and the results are recorded in the IGI Diamond Report. 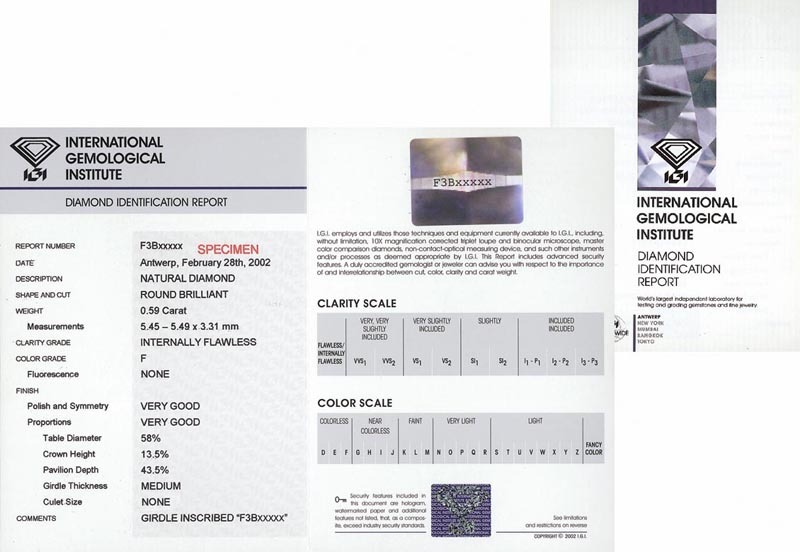 This big, full-page report, containing all report details, a diamond diagram, and unique security features, comes in slightly different sizes, depending on the IGI location where it was issued: United States: 8.5" x 11" (218mm x 278mm) and elsewhere: 210mm x 290mm (8.25" x 11.4"). The stone undergoes a series of analysis encompassing the 4Cs. Graduate gemologists working independently from each other test each stone. Although full analysis is performed and kept on record, the consultation includes color and clarity grading, diagram of the diamond's inclusions, measurements and a report number. 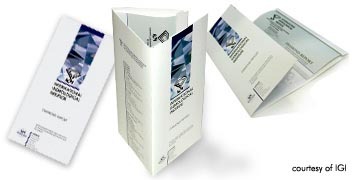 The report holder will have the ability to upgrade to a detailed diamond grading report upon request. 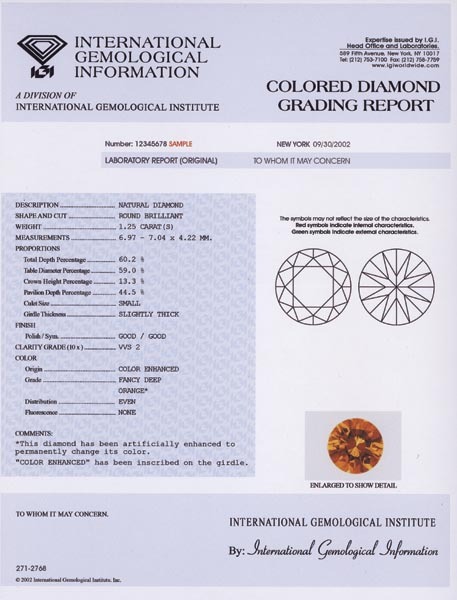 This report provides authentication of a diamond's natural fancy color, as well as a complete analysis of the diamond's 4Cs. With the emergence of sophisticated treatments and processes, this report has become a necessity. The quality of a diamond's cut may be the most important of the 4Cs. The cut quality directly influences the brilliance, fire and scintillation that make diamonds uniquely beautiful. In addition to the quality of the cut affecting the diamond's beauty, it also relates to the diamond's durability and practicality for use in jewelry. The cut grade system is designed principally to quantify the quality of the cut according to its affect on beauty. The purpose for having a cut grade for polished diamonds is to establish a set of criteria that results in an evaluation process that is consistent, reproducible and easily understood by the public. The quality of a diamond's cut is determined by the interplay of a number of factors, which are difficult to assess individually. 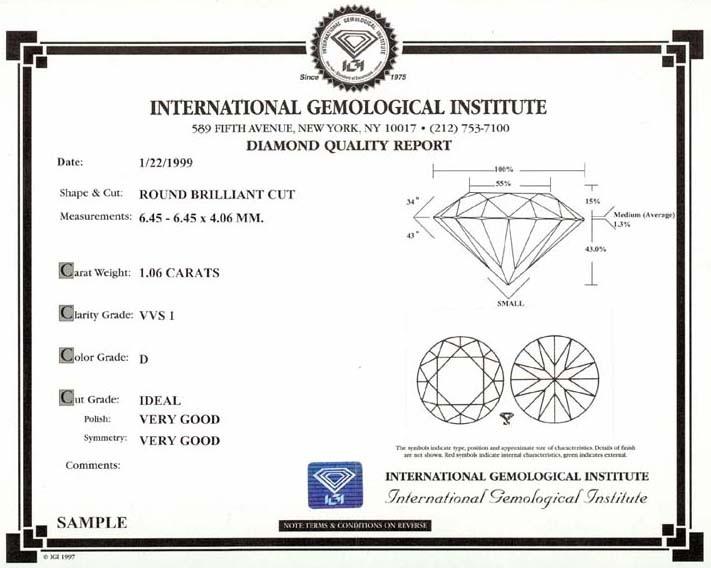 As such, IGI provides a gemologically-based assessment of the diamond and issues a composite grade to communicate the overall quality of the diamond's cut. The ideal cut of a round brilliant cut diamond is striking in its precision and bears an unmistakable witness to the skill and care of the cutter. Diamonds meeting these criteria have less weight retention from symmetrical rough, and require extra time and care to produce the high quality finish. 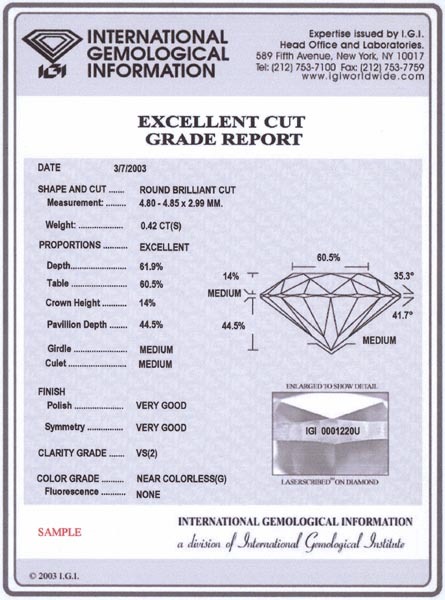 Diamonds with this cut grade are rare and normally cost more than stones of comparable weight, color and clarity. An ideal/excellent cut diamond is polished to such perfection that the balance between brilliance and dispersion is superlative. The best combination of angles and proportion percentages as well as the highest quality of polish and symmetry allow for optimal light return. 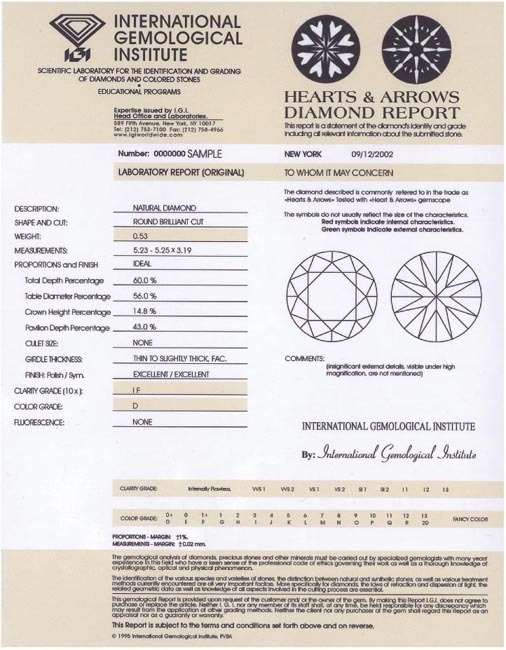 IGI's Hearts and Arrows Diamond Report assures one that the quality of the diamond's cut conforms to an excellent set of criteria. The diamond polisher's technique consists of extremely precise angles in combination with very specific facet lengths and widths. These special cut stones are known to display a visual pattern of eight hearts when viewed through the pavilion (bottom) of the diamond, and eight arrows when viewed through the table (top) of the stones using IGI's Hearts and Arrows Scope. IGI's Hearts and Arrows Report will assure you that your diamond meets the requirements for the top cut grade, polish, proportion and symmetry to maximize the brilliance, dispersion and scintillation visible in diamonds. IGI laboratories are equipped with the most technologically advanced instruments for the identification and authentication of colored stones. These instruments include immersion cells, micrometers, spectroscopes, polariscopes, refractometers, specific gravity liquids, binocular microscopes and spectrophotometers. Techniques such as stone coating, diffusion treatment, heat treatment, polymer impregnation and clarity enhancement as well as sophisticated developments in creating synthetic gems, are commonplace today. 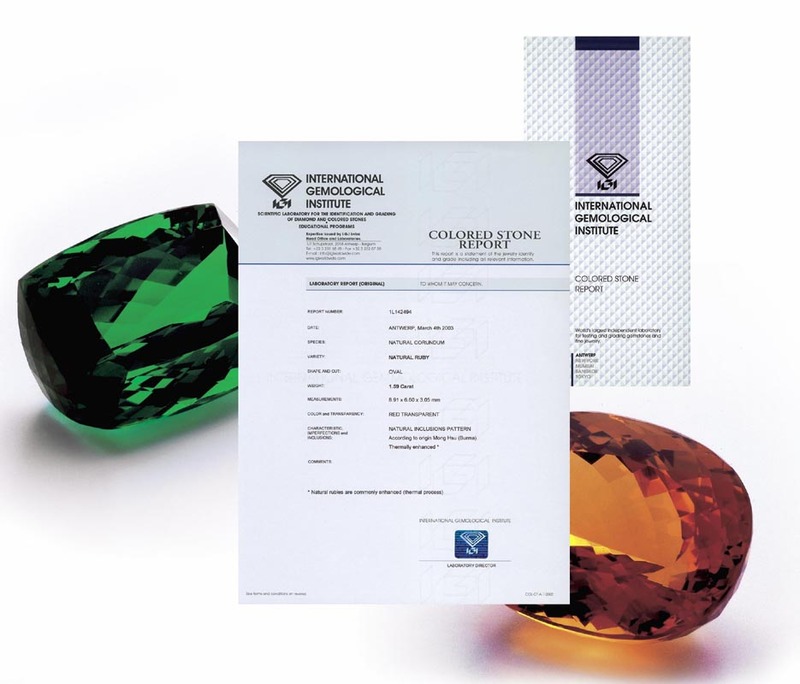 IGI's approach to colored stone analysis is extremely important to you, especially in light of the fast-evolving new techniques being used to alter and treat rubies, sapphires, emeralds and other stones. The colored stone identification report identifies the gemstone's specific variety, shape and cut, carat weight, measurements, color quality and transparency factor, as well as other major optical characteristics. Disclosure of treatments is also noted in this report. Upon request, country of origin may be determined. The certificate clearly states if the stone is natural or synthetic. IGI vigorously monitors its grading standards worldwide to protect and insure against any breach in conduct or security. Clients and employees may anonymously report any suspected cases of misconduct, by way of contacting IGI. For more information about IGI Laboratories around the world, visit www.igiworldwide.com or our Contact Us page.